It's Grymn Out There. : Void 1.1 rules for an in progress army. I have started to build up an army of Grymn Tunnel Fighters and have decided to attach them to the Void 1.1 rule system. With that in mind, I have come up with some rules for the basic squads and have included some points values to aid with selection. 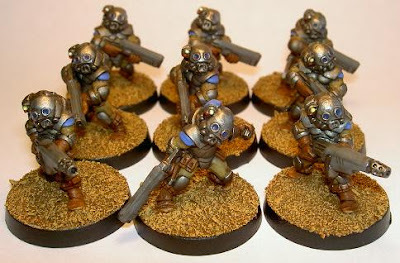 I must at this point, give some credit to the lads and lasses over at the Celtos Legion site (see the link over on the right) as I have been picking bits from their down loadable Grymn army list. Special Rules: (all of the troops in the army will be subject to these rules). Rough terrain specialists: All Grymn ignore any penalties for moving through broken ground due to their expertise at operating in tunnels and mines. Buddy-Buddy: As long as any Grymn squad is not reduced to half its starting troop total or less, it will benefit from a +1 bonus to its CD value. Once reduced to half size or less, the bonus is lost. Fire Teams: The normal idea behind building Grymn squads is to add fire-teams. Whenever you add basic troops to a unit, they will be added in pairs and must have the appropriate price paid for them. Leaders and support troops are not affected by this rule. You may select one support model for each pair of standard troops. 1x Leader: Pulsegun, Combat Blade. 22 Points. 4 to 8 Infantry: Pulsegun, Combat Blade. 20 Points. Leader: Tactical awareness, High morale (+1). 1x Leader: Shotgun, Combat Blade. 21 Points. 4 to 8 Infantry: Shotgun, Combat Blade. 19 Points. 1x Leader: 2 Auto Pistols. 21 Points. 4 to 8 Infantry: 2 Auto Pistols. 19 Points. Leader: Multiple shot (x2), Tactical awareness, High morale (+1). I plan on adding robots, command models and some vehicles to the army so there will be updates as and when I get another step forward. I am hoping that this little army building session will give a small insight into how easy it is to include Grymn in other games...even if you don't have an existing army to proxy for.